You have become the youngest Martyr of the modern struggle for the restoration of the sovereign state of Biafra. At just 17 years of age, you died as you lived. You died a hero of the struggle for the restoration of your fatherland. You died for the course you believed in. You are not even an Igbo speaking Biafran but you loved Biafra more than the Igbos to prove to the world that Biafra is not an Igbo affair. It has always been your desire to correct the narratives by the Lagos - Ibadan expressway based gutter media houses and their One Nigerianist co-travellers propaganda with their British goons that Biafra is for the Igbos. Your love for Biafra was so pronounced that you made sure that the message of Biafra restoration was deeply rooted in your ancestral home of Ikot Nyoho village in Ukpom and in fact your Ikono Local Government Area and in your state of Akwa Ibom in general. Your effort is not in vain. Posterity will not forget your immeasurable and unquantifiable contribution to the restoration of our identity. On the day you were murdered in cold blood for committing no crime, you had "called out" to stop the terrorism in the Nigerian Army with the aim of stopping them from shooting and taking the lives of the Biafrans that the Nigeria Army murderers had pointed their guns on. Unfortunately, rather than your "calling out" making the Nazist Army of Nigeria stop the trigger pulling exercise, it rather angered those terrorists in the Zoo Army uniform who obviously are now getting promoted on the basis of how many Biafran lives they have "wasted". Although you fell for the bullets of the terrorist Nigerian Army who in spite of knowing that you are still under age did not stop from redirecting their guns on you and pulling the trigger thus making you pay the supreme price that Biafra may come, your voice still thunders in the call for the irreducible demand for the restoration of the sovereign state of Biafra. As an unblemished lamb, your innocent blood, like that of Abel is a clean enough sacrificial blood before the throne of the almighty Chukwuabiama demanding vengeance on your murderers. Your death has confirmed one thing: That the Nazist organization called the Nigerian Army is worst than the conventional terrorist organizations. Why the other terror groups kill and admit. The Zoo Nigeria Army targets, shoots, kills and lies about it.They even warn and threaten groups that attempt to expose their evil deeds to the world to either shut up or be dealt with. Amnesty International, IPOB worldwide and her media and publicity officer, Mazi Emma Powerful, Human Right Watch, Intersociety, and others can testify to this. Your greatest regret is that you only have just one life to give for Biafra and for saving other marked for elimination Biafrans. 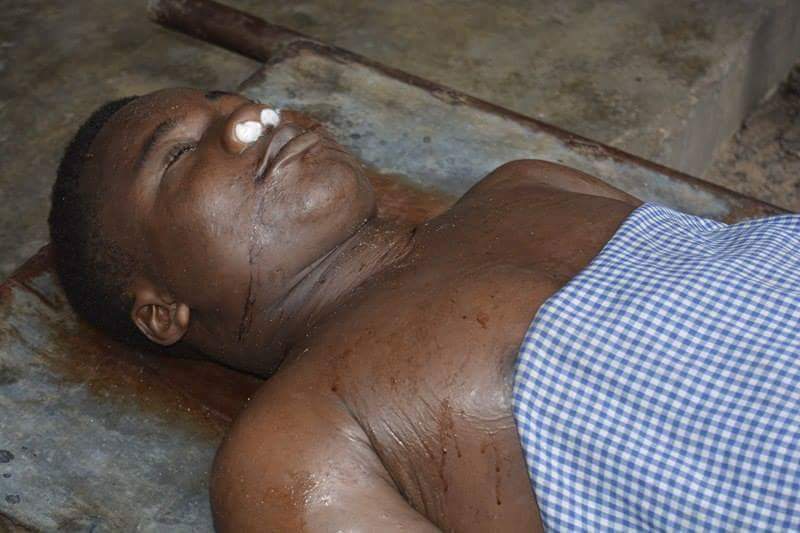 Kingsley Mathew Essien, you are one of the 20 Biafrans that the Nigerian Army murdered in one swoop on the 20th of January, 2017 during the Trump solidarity rally in Igweocha, Biafra land. They had thought that carrying the corpse of the murdered Biafrans will enable them to conceal pieces of evidence of their killings permanently. Unfortunately, typical of those in a haste to cover their tracks, they did not know that your corpse was one of the few recovered from them. Off course, these savages in Army uniform lied that no Biafran was killed during the rally that they acted in the best professional manner ever. Yes! just like you are fond of saying whilst with us that Nigeria is truly a Zoo, a land of liars and cheats. Your killers truly proved you right. We will forever remain grateful to the creator, Chukwu Okike Abiama, for the opportunity of the brief joyful moments that we shared with you. You had a great sense of humor that can even resurrect the dead with laughter. You were fun to be with and intelligent to listen to when debating about Biafra. 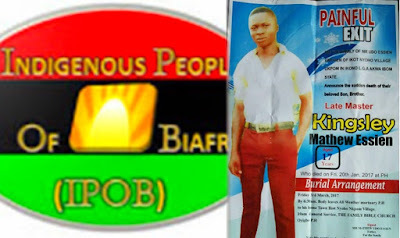 On several occasions, you had held many of your Biafran converts and other listeners spellbound whilst lecturing them on why Biafra is the collective last hope to fruitful future of all Easterners. Your unwavering love for Biafra and Biafrans is legendary thus you were not afraid to lay your life for other Biafrans to live. Just like the holy Bible teaches us, that there is no greater act of love than for one to lay down his life for his friends and countrymen. Kingsley Mathew Essien, for paying the supreme price for Biafra restoration, we will never contemplate surrender or retreat. Our watchword will continue to reflect our: Biafra or Death creed. To your family: We will definitely fulfill our vows that we do not abandon any of our own. As you will be laid to rest on the 3rd day of the 3rd Month of 2017, just rest peacefully in the blossom of the Lord until we meet on the resurrection night to part no more. Good night and Goodbye - the Biafran Rose.